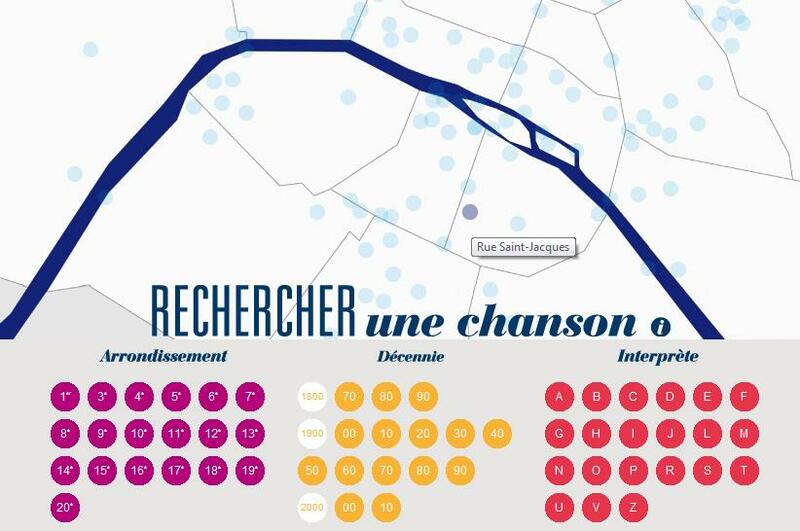 An interactive online map highlights the musical geography of Paris, but what does it tell us about the city? The map, originally created to accompany an exhibition held last year in Paris, plots the lyrical locations of over 200 songs that have Paris as a theme. It's a simple, fun tool to use, allowing you to zoom in on specific districts, then to click and listen to the songs. 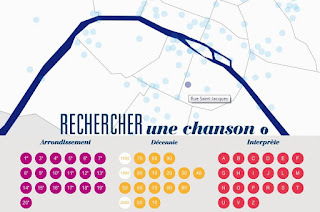 Imagining Paris as a musical map is fascinating. The city becomes a place where you can be transported from one district to another not by Metro, but by song. At each stop it is in theory possible to learn something about the area's history and identity from this musical footprint. Squint at the map and you'll see that these areas are mostly centred around the more popular districts of the city such as Pigalle and Montmartre, or Bastille, Belleville and Menilmontant. But does this tell us anything in particular? Not according to the map creators who point out that songs can be untrustworthy guides: « La chanson contribue à entretenir l’image mythique de certains quartiers de Paris…en décalage avec leurs évolutions actuelles » (songs help to sustain the mythical image of certain quarters of Paris...at odds with their current evolution). In other words, it is a certain number of songs that give areas such as Pigalle a bohemian reputation - even if they are in fact almost entirely bourgeois today! The map is a celebration of the rich musical heritage of Paris, but feels like a historical document. It tells of a 'Paris perdu', a lost city that exists today just in song. As the exhibition - and the map - was put together in part by city’s historical library, this should not be surprising. This Paris perdu, the areas with the richest concentration of song, is where the musicians, such as Edith Piaf and Yves Montand originally lived in the first half of the 20th century - and where they sang in the many music halls that could be found there. These locations inspired the lyrics to their songs, and recounted tales that the local audience could relate too. What has happened since then? Although the map's earliest plotted track is 'La Tour Saint Jacques' by Jacques Douai which dates back to 1877, it is supposed to continue up to the present day. Click on the 2010 decade though and just three songs appear. For the whole of the 21st century there are barely 15 dots – compared to over 30 for just the 1950s. Wandering around this city, I can't help wondering why today's generation is so silent. Where are the songs that descibribe the Paris of today? Just as Paris itself has slowly been gentrified, so has its music scene. The (rap) artists that are strongly identified with certain locations would be dotted beyond the limits of this map, mostly out in the northern and eastern suburbs. As the working classes have been forced out of the city, so - it seems - has its musical identity and soul. Nor in Paris as far as I can tell. I will hope that it works another day. I'm sorry, I'm afraid I didn't think about whether it would work or not outside of France. The music is provided by Deezer, so I suppose they could have restrictions in certain places.